The idealists out on Islamabad’s streets make the point that we cannot have real democracy without an independent judiciary. True. But equally, we cannot have an independent judiciary without democracy. So if the long marchers succeed in toppling the frail democratic government that is struggling to establish itself in Pakistan, who gains? How much has this ‘long march’ which was not a march but a drive…burdened this deprived nation and its thirsty and hungry people? If street thinking or street power is to be believed, the funds for the lawyers’ movement and for this culmination have emanated from the coffers of Mian Nawaz Sharif and his brand of Muslim League, whose coffers were and are filled to the brim with the nation’s money. We all obviously recognize the symbolism of Pakistan’s judiciary, the merits of the lawyers’ movement, and the wrong in initially firing the chief judges. However, at what point do we also recognize the detriment that such a movement is having on our nation’s economy? The potential detriment to the already fragile democratically elected coalition? Yes, the lawyers’ movement and their supporters want justice, but at what cost? This is not to say we should abandon such a cause, but instead reevaluate our approach. Finally, in other security-related developments, media outlets on Sunday reported that Afghan President Hamid Karzai threatened to send his forces into Pakistan “to fight militants operating in the tribal areas there.” BBC News reported, “His concerns about their increased infiltration into his country are shared by many of Afghanistan’s allies.” Moreover, such concerns were exacerbated further by statements released by Beitullah Mehsud and other Taliban-linked leaders, who have vowed to send fighters across the border into Afghanistan to combat Afghan and foreign forces, [see related post]. 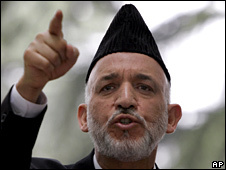 When asked to comment on these threats, Karzai told Reuters, “This means that Afghanistan has the right of self defense…When they cross the territory from Pakistan to come and kill Afghans and kill coalition troops, it exactly gives us the right to go back and do the same…” The Afghan president has long pointed to the Pakistani tribal areas as the root of the Taliban problem, although the BBC reported that his statements Sunday were the most harsh to date. …although record levels of foreign and Afghan troops have constrained repeated Taliban offensives, stabilizing Afghanistan will be impossible without a more robust military campaign against insurgent havens in Pakistan. The question that remains is how can Pakistan respond to this mounting criticism of its government’s current policy with militants? Yes, there is pressure from Afghanistan and its allies to take a stronger hand with these militants, but there is also increasing pressure on this new democratically elected government to distance itself from Musharraf’s past policy with the United States. Moreover, anti-U.S. sentiment in the country only grows with incidents like we saw this past week, [see related post], making it increasingly more difficult for Islamabad to appease all sides. If this post shows anything, it is that this new government is overwrought with issues that only promise to increase over time. Not only does Islamabad have growing tensions with Afghanistan, NATO, and the United States, but also a number of problems at the domestic level. What should the government address first? Moreover, what problem can this coalition ultimately solve? What’s the Deal with NATO & Afghanistan? These overtures and international pressures are in stark contrast to the “conditions for talks” voiced by members of the Pakistan Taliban, namely the umbrella organization, the Tehreek-e-Taliban Pakitan (TTP). On Saturday, PM Gilani said that fighting terrorism would be his top priority but offered to hold talks with militants who laid down their weapons. On Tuesday, an editorial in the Daily Times noted the TTP welcomed this offer, but said the new government must give up their “pro-U.S. stance first.” The Times added that some newspapers reported it as “sever ties with the U.S.” The editors noted, “The TTP warriors also demanded implementation of sharia law and the jirga system for their territory…They added, however, that ‘jihad against America would continue in Afghanistan”, but that they were ready ‘to end their activities and improve law and order in Pakistan if the government showed flexibility. '” The Daily Times assessed, “Pakistan may delink itself from the global war against terror but it will be obliged to end any cross-border attacks into Afghanistan from its soil in general and the Tribal Areas in particular. It remains to be seen how it can meet this obligation under international law without retaining some kind of coordination of strategy with the Afghan government and the ISAF-NATO troops stationed there under a UN mandate.” Basically, negotiations with the TTP, given their demands, coupled with the pressures from NATO, the U.S., and the international community, translates to a bit of a conundrum for the Pakistani government.